It’s February. February in Germany means costumes in large department stores because of Carnival and maybe (hopefully) snow, but on this blog it means 28 Days of Blogging. 28 Days of Blogging is pretty much exactly what it says on the tin – a blog post for each day of February. I did this last year already, and you can read my reasons why I did it here – TL; DR: to find my voice, to build a buffer, to rebrand. This year the reasons stay sort of the same. After my more or less involuntary break I want to get back on the blogging horse, I want to re-learn how to write and have ideas and inspire in words rather than just moving pictures (although I will hopefully keep up with YouTube as well but I honestly don’t worry about this as much), get back into the flow. There’s also still the issue of a re-design… I did not lie when I wrote last year that it was almost done, and it still is. It’s the tiny little things that bug me, a line here, a font decision there, that have prevented this blog from looking different for over a year now. Ugh, this needs to change! I might have to redraw a few things. Each time I look up blogging advice the internet tells me that I need to niche in, keep it simple, write what I know, stay with one or two topics. I can’t, though. I’ve never been good at sticking to a topic (ask my teachers, professors, friends and family. I digress. A lot). 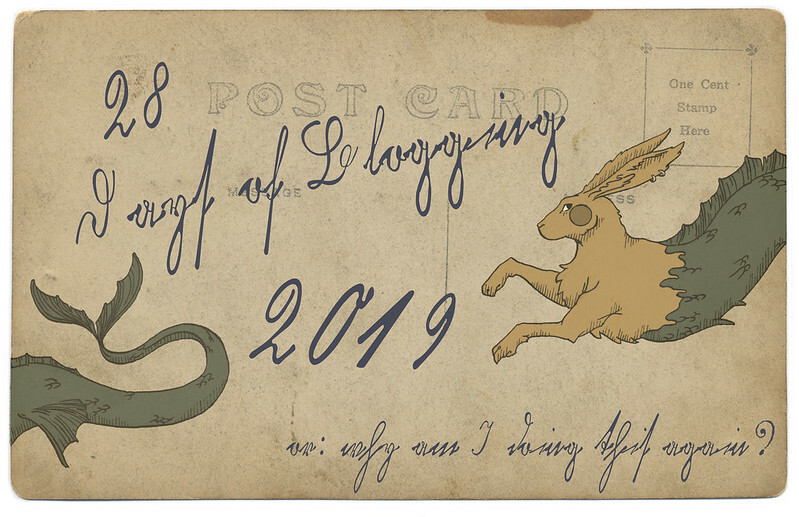 I have a ton of ideas and other strange things floating through the back of my head and so even with the re-design to come, even with #28DaysOfBlogging, even with looking up more blogging advice on the vast wide web Hedgefairy Tales will not branch in. It’s a wild, magical hedge, a threshold to a realm of myth and feral magic, not a neatly trimmed topiary. Sorry if you like your digital garden neat. Anyway, I hope at the end of this month you’ll look at this blog and find it, much like nature herself at this time, rejuvenated, refreshed, full of sprouting green things. That sounded weird. Welcome to #28DaysOfBlogging 2019. This post is (no kidding) part of #28DaysOfBlogging, a challenge to post every day in February. Applethree | Mondkunst | Increase Creativity | Digitallotsen | Haus und Beet | Gut Essen in München | Out of Munich | Vorunruhestand | Mami Rocks | Ciclista | Flying Thoughts | Ich lebe! Jetzt! My digital garden does not to be neat. Neither does my real one. Go wild. Here’s to keeping your digital garden wild and free! Interesting people are interesting, no matter what they’re writing about! Awww, thank you, this means so much to me! I'm Ari, welcome to my little corner of the woods. This is a place where I write about my lifestyle (making this a lifestyle blog): alternative living, nerd hobbies, fashion and there might be the odd recipe thrown in, too. Look around, I'm happy to have you here! A blog never tells the whole story. While most of my life I present here looks like fairy tales and stardust all the time, it isn't. Fairy tales don't work without trials, as does my life, but I rather prefer to show the lighter side of things. This is a private blog. All pictures, unless otherwise credited, are by me. Please, please, please do not take them without my permission. If you want to cite me, please link back to this blog (if you'd like to pin my pictures, feel free as long as you don't remove the link). I also dissociate myself with and am not responsible for the content of sites I link to.